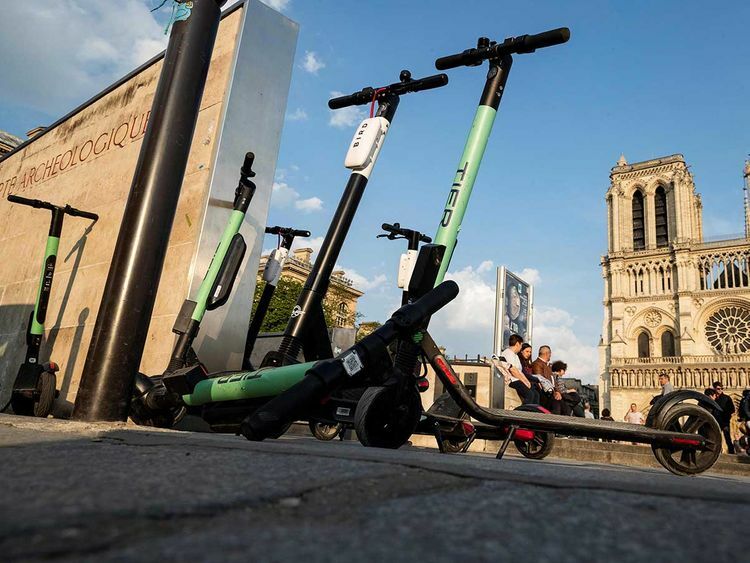 PARIS: The city of Paris on Wednesday adopted measures to rein in the swarm of rental electric scooters that have popped up around the city, including a steep fine for riding on pavements. The services, from companies like US-based Lime and Bird, have proved wildly popular in many cities, though critics say they have often skipped asking for permits. Riders use an app to find the closest scooter and then leave it where they want - which is not always in a designated parking spot. Often, they are seen strewn on squares, abandoned in front of buildings or clustered around Paris landmarks. The French measures came on the day German ministers agreed their own rules for scooter users - ahead of allowing them on the streets. After transport minister Andreas Scheuer labelled the two-wheelers a “genuine additional alternative for cars” in traffic-choked cities, the cabinet agreed that “very small electric vehicles” with a top speed of up to 20km/h will be permitted. Once approved by parliament’s upper house, scooters with top speeds up to 12kp/h will be open to use by people over 12 years old on pavements. Faster ones will be reserved for those over 14, and allowed only on cycle lanes - although they can take to the road alongside cars if none is available. Berlin riders will neither need a licence nor a helmet, but will need insurance. Berlin is hoping the strict rules will help avoid the friction that has marked scooters’ appearance elsewhere, including in Paris and Los Angeles. In Paris, riding on the pavement will in future bring a €135 fine ($150, Dh550.5)) for “endangering pedestrians, especially older people and children,” Mayor Anne Hidalgo’s office said. Parking in such a way as to obstruct traffic or pedestrians will mean a €35o fine - but the Paris city council has pledged to build parking spots for 2,500 scooters. Paris will also start charging operators an annual licence fee of €50 to 65 per scooter, depending on the size of their fleets. The nine operators currently in the city will also have to sign a “code of good conduct”.